Though a formidable lightsaber combatant, Darth Vader lacked the finesse of most of his opponents. He relied instead on the raw strength of the Dark Side to crush all who opposed him. Constructed from durable die cast metal components, this fx lightsaber also features a permanently attached polypropylene blade which encases and electro-luminescent (EL) core. Integrated sensor switches control the pitch and playback of the lightsaber sounds, including an impact sound when the blade encounters an obstacle. Features 8 motion sensor controlled sound effects: power-up, power-down, idle, movement (4 sounds) and clash. Once activated the blade glows brightly and the replica plays back digitally recorded sound effects taken directly from the film. When not in your grasp, proudly show off your galactic weapon in the specially designed base that allows two positions of display. Star Wars products are produced by Hasbro under license from Lucasfilm Ltd. 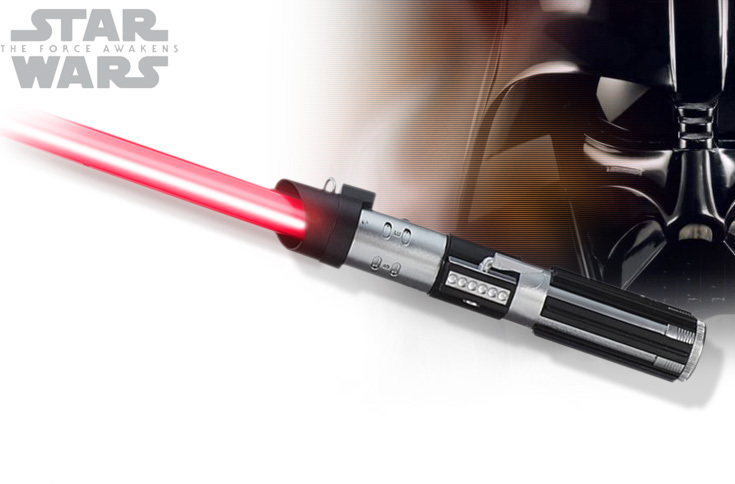 This Force FX lightsaber is sold as a collectible. It is not a toy and not intended for hard use or striking others. Recommended age 14 years and up. Adult supervision required. • Sabre Weight incl. batteries: 1 lbs. 7 oz. • Requires 3 AA 1.5 V batteries. The Hasbro Force FX lightsaber features a permanently attached polypropylene blade which encases an electro-luminescent (EL) core. The power-up and power-down light effects are produced by a string of 64 super-bright LEDs that ignite sequentially inside the blade. The lightsaber, is indeed an "elegant weapon", a powerful image combining the magic sword, light, fire, and energy. It is a laser; blocking another saber, it is light made solid, a remarkable concept. The sword, the active solar weapon of the hero-knight, has long been regarded as magical in itself, often having a name and a persona of its own in folklore and in such modern writers of traditionalist fiction as Tolkien, Bradley, and Moorcock. Beware of counterfeits! Always insist on the officially licensed high quality collectibles.